I’ve seen this question being asked by many people. “How can I generate a security report for Planning?”. This report should provide all access information about Webforms, Dimension. Of course you can use ExportSecurity.cmd and export the information from Planning. Yes you are right there. However let me ask you this, how about the inherited access (i.e. the access a user gets from a group he/she is part of). You’ve to now search for group and then derive the access of the user. You can log into Shared Services and generate a PDF report on Planning security. You can select Users/Groups from this screen. This is an excellent feature for Hyperion Security Administrators. In fact this is not a new feature which we can generate same kind of report from shared services in the earlier version 9.3.x. This report worked fine for me until we upgraded from 11.1.1.3 to 11.1.1.4. The report disappeared from the menu options. I really miss it! I have a problem in shared services. I want assign a essbase filter from shared services but when i select application under application group and right click and click on assign access control i got this ERROR Network Error : Unable To Locate [king.localdomain] In Hosts File. i also did this in my pc hosts file and point your Essbase server name to 127.0.0.1.
but it did not solve the issue. Could you help me on it. Thank you , this is very helpful. 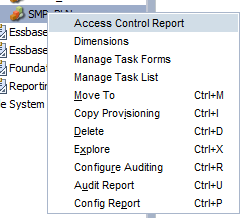 Could you also please help with the sql query we can use to get the Hyperion user creation/modified report. That would be Awesome.Much Appreciated!!! as new note on this, know that the feature is now under Planning. Tools -> Reports with the same functionality as before. This has changed from 11.1.2.3.700 onward when using IE11.